System Automatic Rinse Aid effectively assists the final drying process of dishes and cutlery that is washed in cabinet dishwash and glasswash machines. 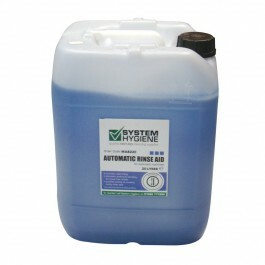 Ideal for use in hard and soft water. Leaves glasses and crockery sparkling and streak free. Also available in 5ltr and 10ltrs. Apply the product via the machine's automatic dosing system then adjust the concentration until effective results are being achieved with the minimum of product. A temperature of at least 60°c should be provided for the rinse aid to work effectively.